One out of four adults in Trinidad and Tobago is unable to perform basic, everyday reading and writing skills. Less than half the adult population can read and understand the newspapers and simple medicine labels. In Trinidad and Tobago today if you are not literate, you are left out of life. 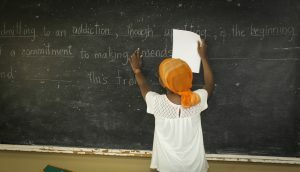 Literacy is the key to a good job, access to services, participation in community, school and church. Sponsoring an ALTA student will enable ALTA to continue offering free literacy classes to the national community, benefiting existing and potential literacy students. 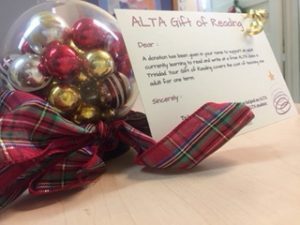 In the spirit of giving, sponsor an ALTA student at a class in your community or anywhere around the country for $200 TTD (for one term) or $600 TTD (for one year). If you donate $600 you will receive a report of the progress of the student you chose to sponsor at the end of the year. Purchase a Gift of Reading Certificate as a gift for a colleague, friend or family member. A donation will be given in their name to sponsor an ALTA student for one term ($200 TTD) or one year ($600 TTD). Call or email us your order beforehand. Give us one (1) business day to get the order ready. Come in to any of our offices in Belmont, Arima or San Fernando. We accept cheques (The Adult Literacy Tutors Association), Linx and cash. You can also make a bank deposit and come in with the receipt if this works for you. Make payment via cheque (The Adult Literacy Tutors Association), Linx or cash at any of our offices. You can also visit any NLCB Lotto Center and tell the operator you wish to donate to The Adult Literacy Tutors Association with Account Number 14 and provide your $200 or $600 donation and you receive a receipt – take a quick picture of the receipt and send it to us. Thanking you in advance for your support this Christmas! On November 1, 2017 the Adult Literacy Tutors Association launched a brand new logo. The launch of the logo, which was designed by Keya Marketing, is the first of a number of events planned for ALTA’s twenty fifth anniversary. Celebrations begin this month and will run until September 2018. The logo which is meant to reflect youth, vitality, relationship building, transformation and social movement has been well received by ALTA’s membership. The desire to remain relevant in the minds of the public, led to ALTA taking many steps in the past year to establish and maintain a strong brand presence. All the advice received said that the logo needed to be updated. The black and white logo which many have come to know, served ALTA well in the largely print medium of the first 25 years. However it doesn’t work as well on the screens of phones, tablets and computers. The teal and orange in the new logo are colours which stand out on these devices and reflect the youthfulness and vitality which this logo is meant to represent. As ALTA turns twenty five, the three main goals are to develop ALTA Online, strategic planning and spreading awareness of ALTA. The third goal will be achieved when ALTA becomes a household name. While the program is known very well locally and even regionally, a lot of work still needs to be done with strengthening brand awareness and ensuring relevance in the minds of the public. Additionally, the anniversary will be marked by celebrations in all regions. Rather than hosting a national event, the seven regions of ALTA – North East, North West, Mid East, East, South West, South East and Central – will host events for tutors, students and members in their respective regions. There is also a plan to host Tutor Recognition Awards for members who have served with ALTA for a number of years and those who continue to go above and beyond the call of duty. The anniversary will also see the launch of the highly anticipated Republic Bank sponsored ALTA Online programme. ALTA Online will bring the ALTA programme to anyone with an internet connection. People 9+ will be able to access this online programme to strengthen their literacy skills via their computers, tablets or phones. ALTA looks forward to another twenty five years of empowering adults through our literacy programmes and remains grateful to all sponsors who continue to support ALTA’s initiatives.